Noted For: Comic book adaptations of many licensed properties, including Warner Bros., Disney, Walter Lantz, and more; and some original material. an important, behind-the-scenes part of the comic book industry since the very beginning. Gold Key's parent company, Western Printing and Lithographing Co., was the publishing arm of Kay Kamen, a prominent figure in the history of character licensing, who had been the first to license the cartoon characters of Walt Disney — among others — for use in other media. From 1938-62, Western contracted with Dell Comics to produce its comic books. 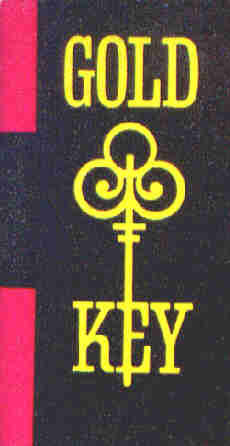 In 1962, the arrangement came to an end, and Western launched Gold Key to perform that function. Gold Key continued to license new properties, such as those of the DePatie-Freleng studio and new movies and TV shows, and to produce its own original works, such as Wacky Witch and Baby Snoots, for the rest of the 1960s and '70s. By the late 1970s, however, comic book sales in general were down, and Gold Key, which had started out with sales in the millions, felt the crunch particularly badly. Exacerbating the situation was the fact that other publishers were compensating for sales shortfalls with revenue from licensing their characters — but Gold Key was mostly a licensee, not a licensor, and therefore couldn't tap this resource. In the late '70s, they experimented with pulling their comics off of newsstands and distributing them through toy stores and other non-traditional outlets, in bags of three comics each; but this was a dismal failure. In 1981, Western dropped the Gold Key logo and put the comics under the Whitman imprint, which had long been used for coloring books, Big Little Books, and some comics. Eventually, they started doing what had once been unthinkable — voluntarily letting some of the licenses lapse. By 1984, they were completely out of the comic book business. Today, the Warner and Hanna-Barbera comics are published by DC Comics, with which the companies now have corporate ties. The Disneys go through Gemstone Publishing, which exists largely just to publish them. Most of the others have completely disappeared from American comic books. Text ©2000-10 Donald D. Markstein. Art © Gold Key Comics.